For the fourth year in a row, craftsman Charlie Hulien is presenting Santa Clarita with artisan woodwork – Handcrafted by Charlie. Charlie has been creating high-quality woodwork out of his Valencia home for years, and is no stranger to local community events and craft shows. Charlie started his career by joining the US Navy 2 weeks after high school. Retiring from the Navy in 1980 he was hired by Lockheed Martin where he worked on the legendary F-117 stealth aircraft until their Burbank factory was closed in 1990. Following the factory closure, Charlie joined the Screen Actors Guild and worked as an extra, stand-in, and actor for TV and movie production. Working with the SAG until 2005, Charlie was rehired by Lockheed Martin and retired in 2008. Charlie now prides himself by pouring himself into his craft. If you can think of it he can make it. Over the years he’s produced beds, tables, chairs, dressers, clocks, bannisters, children’s toys, plus many more. Using high voltage electricity, Charlie creates works of wooden art. Burning channels into the wood, Charlie creates a unique look. No two pieces look exactly the same. From there he can create tasteful looking displays. Art doesn’t have to be without function, though. Turn these pieces into a vase or a pen and pencil holder. Charlie creates beautiful bowls, vases, paper towel holders, goblets, and more through a process called turning. Stunning pieces are produced by looking at the grain of the wood and allowing natural features to shine through in the work. 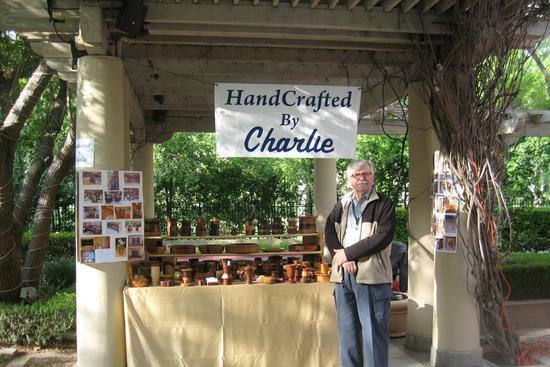 Whether you are looking for form or function, Handcrafted by Charlie is sure to please. Be sure to visit him at this year’s Home and Garden Show.